Your laptop will be completely disassembled and any moisture removed. The component will then be washed down with a special solution to remove any residual impurities, from what was spilt; sugar, salt, etc. The Laptop will then have a full hardware service only then can we assess the laptop to identify any further damage, the chance of the unit being fixed after performing this treatment is quite high. If the laptop fault persists we can provide and optional “Heat treatment” The laptop mainboard is strapped into a jig, the mainboard is then heated up to a temperature where the solder softens allowing the surface mount and soldered components to make a renewed connection to the mainboard. A lot of the time this resolves incorrect voltages across the mainboard. ***Should the unit still have issues we will provide a quote, or provide an insurance quote if applicable. This could be caused by the laptop LCD ribbon cable (see above) or it could relate to the video card. The laptop video card can fail due to heat which means it could be fixed with a hardware service or the video card needs to be replaced. Is your Laptop keyboard working ok, but you’re missing keys? We can help with missing keys. We have a large variety in stock or we can order them in at fraction of a full Laptop keyboard replacement. Can be easily resolved with hardware servicing. As Laptop are very mobile, it is not uncommon for “things” to get loose and stop making a clean connection causing intermittent faults. Be it that your machine does not boot and you need the data recovered or it’s a software issue like stuck in windows updates or not booting into windows. 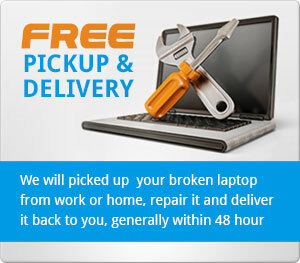 We can resolve any laptop software issues. Due to the design of laptop these days it is not easy to replace or upgrade faulty hard disc in Laptop’s. We can assist with all laptop hard disc replacements. Be it that your hard disc has failed or you need to upgrade because your laptop hard disc has run out of space. This is a common problem, again due to the design of the cooling systems, the fan setup, draws air into the laptop through the cooling system and out of the laptop. Dust gets built up in the cooling system, which makes the fans run consistently to try and keep the Laptop running at an operating temp. Once the Laptop’s temperature rises above it nominated temperature it will shut the laptop down. In some cases the cooling fan or unit need to be replaced. This could be caused by something as simple as faulty power supply or it could be a hardware service that fixes the problem, either way we provide a FREE quote so you know exactly what your costs will be. No problem, our main objective with this type of work is to remove any offending software without any data loss or having to reconfigure your internet, email accounts or load any software. In most cases we are successful at this. The computers that do need to be reformatted to resolve the problem, all data is backed up and cleaned from any nasties, once the new windows installation is complete we will put your data back into their original location, we are happy to install any software you have, activate it and update it as well. And of course we provide solutions so you will not find yourself in this position again. This could be hardware or software related, we are happy to provide a free quote on what is required to repair the system. There are several different option of recovering data from your laptop, the below are to be used as a guide only. Remove hard disc from computer and configure to backup server, backup selected data to another medium, scan recovered data for infections/virus, prepare backed up data to extract/secure data as per customer’s request. Remove hard disc from computer and configure to backup server, ghost data to another medium, scan recovered data for infections/virus, prepare backed up data to extract/secure data as per customer’s request. Remove hard disc from computer and configure to backup server, configure software to extract undamaged data to an image, check image integrity, extract to another medium, scan recovered data for infections/virus, prepare backed up data to extract/secure data as per customer’s request. Remove hard disc from computer and configure to backup server, run numerous diagnostic tools, prepare hard disc for optimum conditions to retrieve data, perform sector repair, intense scan to retrieve data, check file integrity, check individual file for corruption, extract recovered data to another medium, check image integrity, scan recovered data for infections/virus, prepare backed up data to extract/secure data as per customer’s request. We can help! In some instances a Laptop maybe beyond economical repair. If you’re insurer requires a quote we are happy to provide and comprehensive insurance quote and options of a replacement laptop. As all components of your laptop need to be asses on their own merit it does take 48 hours to provide the report and we are happy to fax it straight through to your insurer.